Jeep recently launched their youngest variant in India i.e. the Jeep Compass. The vehicle surely created an impressive hype among the Indian consumers and people have been really drooling over the Compass. But to make sure that it occupies a good position in the Indian market for a long time, the Compass will need to give a stiff competition to the Hyundai Creta. 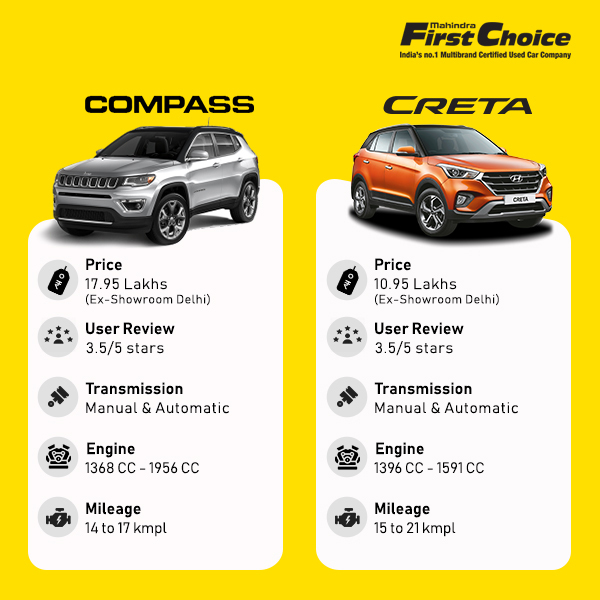 In this article, we will compare the Jeep Compass with the Hyundai Creta and check which car has more to provide to the Indian customers. The Jeep Compass grabs a more significant attention when it comes to design. The seven-slat grille and the sleek bi-xenon headlights have been designed very fluidly. It gives an aggressive appearance which also reflects much modern and sophisticated design. The Jeep Compass will surely impress anyone who is very conscious about how their car will look. On the other hand, the Hyundai Creta also has a unique design but it has not yet been revamped or redesigned. So it looks very familiar and dated to the Indian consumers. Therefore the Creta fails to match the Jeep Compass’s appeal and modern approach. The Jeep Compass is also much more appealing and aesthetic in the inside. The premium quality dual tone finishes on the seats and dashboard gives it a great feel. However, the plastics used could have been better. The Compass also has a 7-inch touchscreen infotainment system. One disappointing factor is that the Compass receives only a digital compass which is dated now. The Hyundai Creta also has the 7-inch touchscreen infotainment system. The seats feel premium and comfortable but not the same as Compas’s. Jeep has absolutely given attention to all the details in the cabin which helps it to stand out. The leg space in both the SUVs is enough. Leg space is fine and one can easily adjust in the cabin without any hassles. However, the Jeep offers a slightly better front passenger space. Storage options are also the same in both these SUVs. The Jeep Compass has the 2.0-litre diesel that produces 173PS and 350NM. The Creta is available with a smaller 1.6-litre diesel engine which gives out 128PS and 260NM. However, the Creta does not lag behind the Compass in any way. The Creta actually is 0.7s quicker to reach 100kmph than Compass at 11.2s. The Creta is more responsive and quieter than the Jeep Compass. The diesel engine in the Creta revs more power and can be easily taken out to the roads with more feel and versatility which the Compass lacks. However, Jeep Compass performs much better off-road than the Hyundai Creta because the latter is more of an Urban ride. Final Verdict – the Jeep Compass surely stands out in term of looks, interior aspects and design. But the Creta still manages to show that it has not left the competition yet by delivering versatile on-road performance which the Compass couldn’t match. The Jeep Compass is available from Rs. 14.95 lakhs whereas the Hyundai Creta is available from Rs. 10.6 Lakhs. Previous Test Drive A Used Car – Why Is It Important?